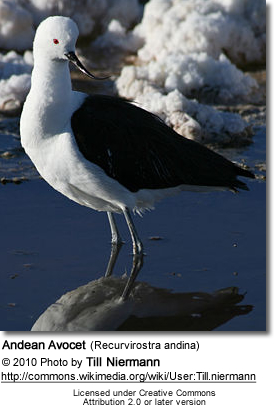 The four species of Avocets are waders in the same bird family as the stilts. They are typically found in warm climates. They had been extinct in Britain for a long time because of land reclamation of their habitat and persecution by skin and egg collectors, but during or soon after World War II started breeding on reclaimed land near the Wash which was returned to salt marsh to make difficulties for any landing German invaders. 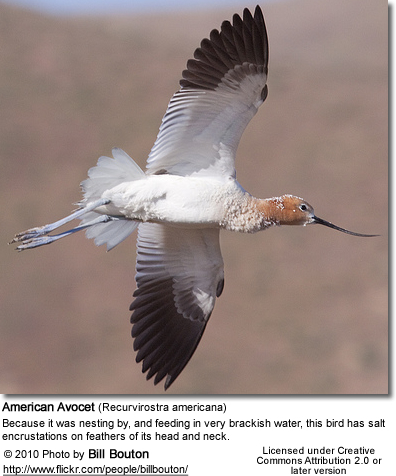 Avocets have long legs and long, thin, upcurved bills (giving their scientific name Recurvirostra) which they sweep from side to side when feeding in the brackish or saline wetlands they prefer. The plumage is pied, sometimes also with some red. Members of this species have webbed feet and readily swim. In a large colony they are aggressively defensive and chase off any other species of birds that try to nest among or near them. 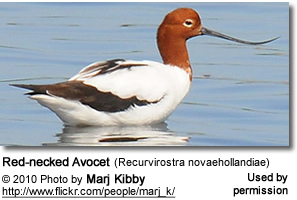 That causes the annoyed remark "Avocet : Exocet" from some British birdwatchers. Their diet consists of aquatic insects and other small creatures. In estuarine settings they may feed on exposed bay muds or mudflats. They nest on the ground in loose colonies.